Sub Focus, Booka Shade, Route 94, Klingande, Sam Feldt, Riton and Kah-Lo have been added to the Sout West Four 2018 line-up. 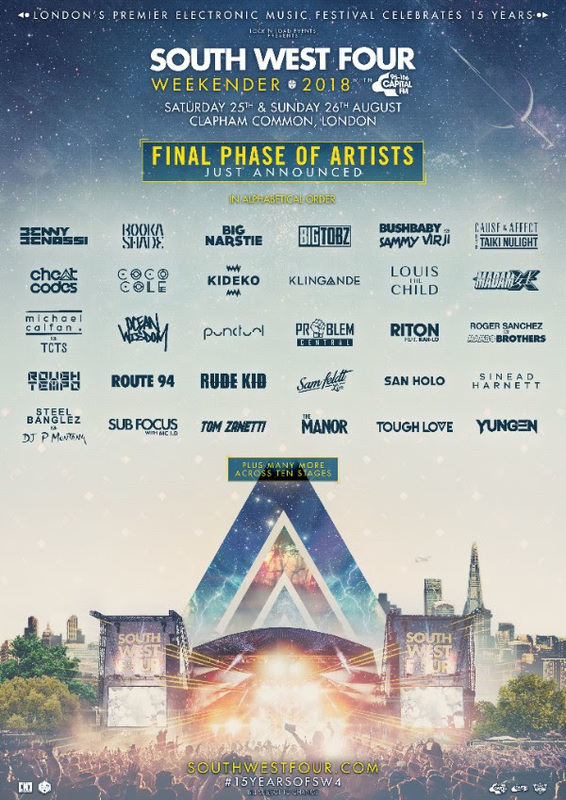 The 15th anniversary edition on Saturday, August 25th and Sunday, August 26th at London’s Clapham Common has also revealed further acts for both days. Added to the Saturday are Benny Benassi, Booka Shade, Cheat Codes, Coco Cole, Klingande, Louis The Child, Punctual, Route 94, Sam Feldt Live, San Holo, Sinead Harnett, Tom Zanetti and Tough Love. Sunday’s additions are Big Narstie, Big Tobz, Bushbaby b2b Sammy Virji, Cause & Affect b2b Taiki Nulight, Kideko, Madam X, Michael Calfan B2b Tcts, Ocean Wisdom, Problem Central (Logan D, Majistrate, Evil B, Eksman) Riton & Kah-Lo, Roger Sanchez B2b Mambo Brothers, Rough Tempo DJs, Rude Kid, Steel Banglez b2b P Montana, Sub Focus, The Manor and Yungen. For tickets and details go to southwestfour.com.